Turn your granny's doily into a fabulous new hat. First of all, you need a doily. You could easily get one at a thrift store, or make one yourself. (There are tons of tutorials online.) The doily should be at least 30cm in diameter, the bigger the doily, the floppier the hat will come out. Single crochet around the doily once. If necessary, decrease some more until the circumference fits your head. There's no such thing like a "recipe" for this step, because the number of stitches you have to decrease depends on the doily's diameter. You basically just have to guesstimate how much you need to decrease. SC around until you reach the desired length. 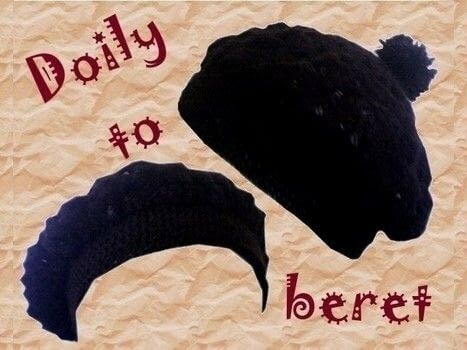 Weave in tails and voilá - you've just made yourself a brand-new beret.